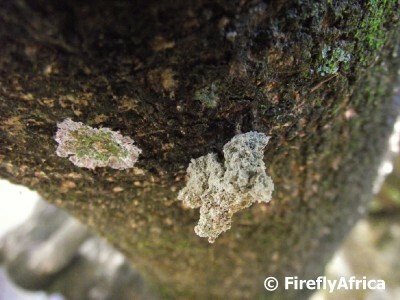 During our camping holiday in the Drakensberg I rolled my ankle on one of the hikes because I was looking around for interesting stuff to photograph and not where I was walking. So somebody asked me at the office why I don't watch where I am going. Because then I would miss the little things. 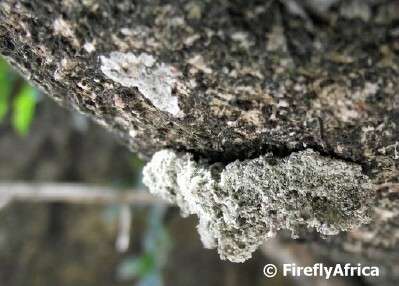 Things like ants taking food to their nests. 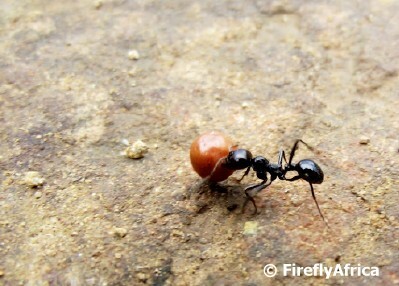 A seed nearly as big as the ant himself. And this was a big ant. This butterfly (or moth) was done and delivered. They didn't have any use for the wings though. 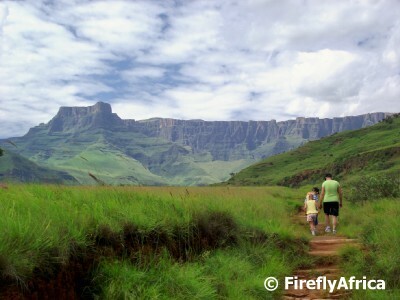 Probably the best known and most photographed feature of the Drakensberg is the magnificent Amphitheatre. Unfortunately due to all the rain in the area when we were there the Amphitheatre was only visible in its full glory on two out of the ten days of our visit. 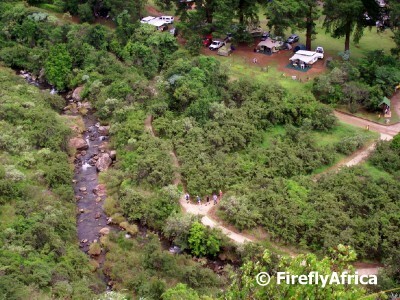 The Amphitheatre is a 5 kilometer wide 1220 meter high rock wall towering above the Royal Natal National Park below. 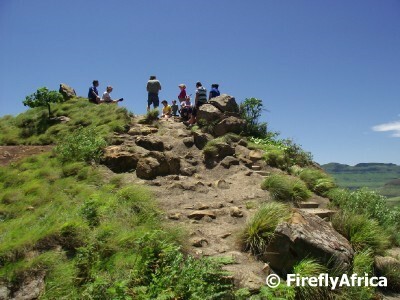 The highest point on top of the Amphitheatre is Mont-aux-Sources which stands 3282 meters above sea level. 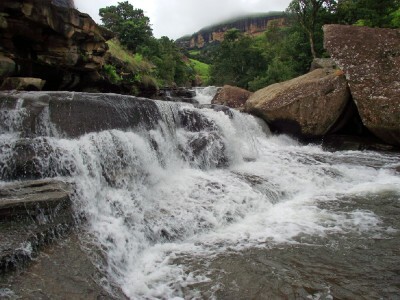 Both the mighty Orange River and the great Thukela (Tugela) River has their source on top of it while the Tugela Waterfall which cascades 948 meters down the rock face over five free-leaping falls is the second highest waterfall in the world. 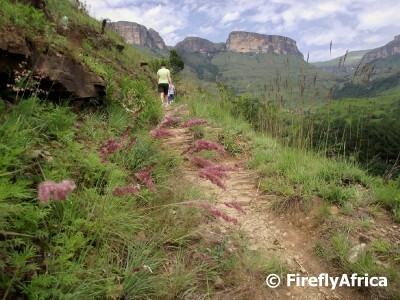 The other day I did a blog post of the hike we did on the Lookout Rock / Tiger Falls route in the northern Drakensberg. 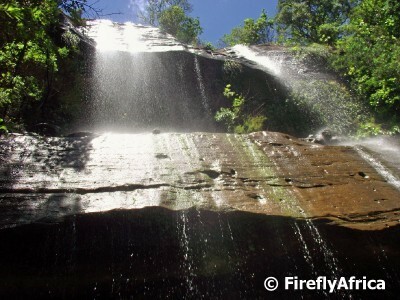 The Tiger Falls are one of the main waterfalls in the Royal Natal National Park and is visible from the Mahai campsite as it makes its was down the mountain. The hike took us past the big section of the waterfall roughly in the middle of the picture above. We did the hike before all the rain hit the berg so it wasn't in full force when we stopped by, but it was still a very beautiful sight. 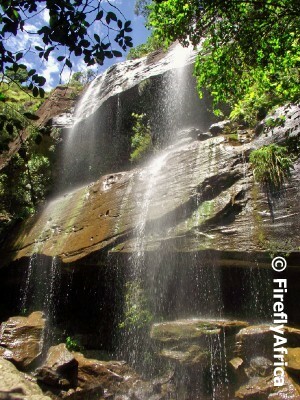 I'm not sure where the Tiger Falls got its name as there isn't any tigers in South Africa. 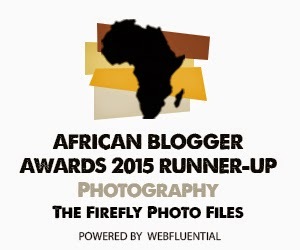 My thought is that it may refer to leopard as the people referred to them as tigers in the early days. I was able, after a lot of slipping and sliding, to climb up behind the waterfall and get the shot above looking through it. For me the journey to a destination is just as important as the destination itself. So many people get on the road and is in such a hurry to get to their end point, that they miss out on a whole lot of attractions and sights along the way. Along the way I normally do quick detours into the towns I pass if time allows and the first thing I go looking for is the church. Most small towns originally developed around a church in the early days which means that the chances are good of finding at least a historic church in them. 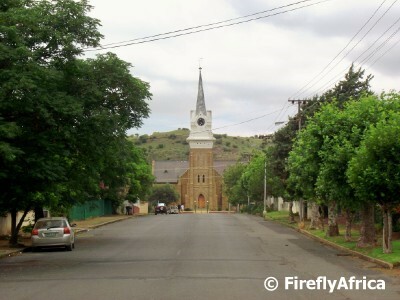 I was heading towards the Drakensberg through the Eastern Free State on a very gloomy day and although the day was getting on a bit, decided to swing through the town of Wepener close to the Lesotho border for a quick bit. 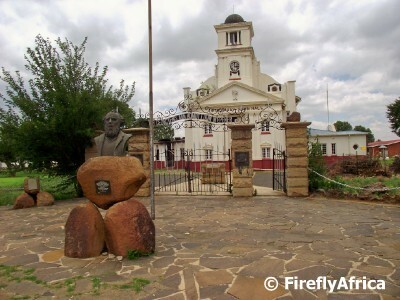 Wepener was named after Louw Wepener who was the Boer leader in their war with the Basotho people. He was killed in 1865 while trying to storm Moshoeshoe's stronghold of Thaba Bosiu. When a town was established in the "conquered territories" in 1867 to prevent the Basotho from resettling the land taken from them during the war, it was decided to name it after Wepener. 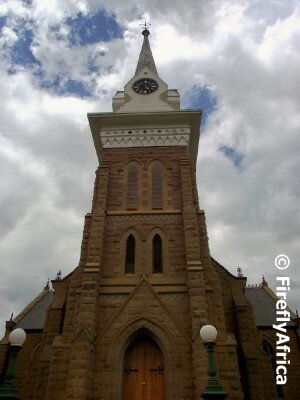 The Dutch Reformed parish was established in 1870 which means that the church would also date from about that time. The other historic building I found in the town is the old town hall. In front of the building is a bust of Wepener as well as a number of smaller memorials. 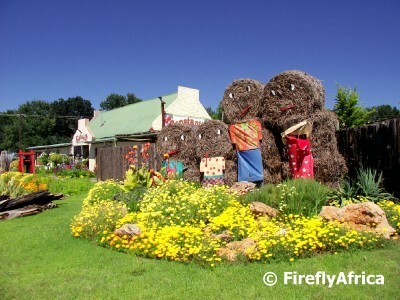 The area around Wepener consist mainly cattle and sheep farms while crops like wheat and maize are grown. After I took this photo and had a look at it on the camera, I kinda heard him say, "Hey buddy! What you looking at?" What is it with farm stalls that make one want to turn off and have a look and see what they have to offer? 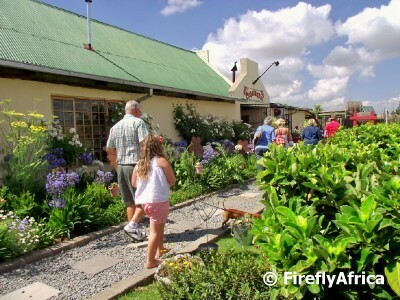 Driving through the Eastern Free State on our way to the Drakensberg, we saw the Constantia Farm Stall (not referring to Constantia in Cape Town) outside Fickburg beckoning and slowed down for a look. 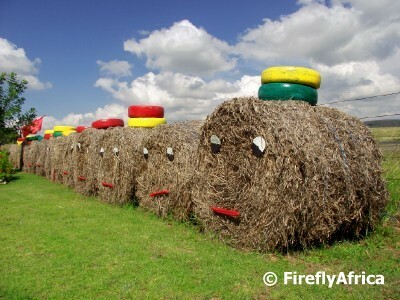 The farm stall catches ones attention immediately as you come down the road with its "hay bale heads and figures" right next to it. Although I have seen something similar in the Western Cape, I thought it was quite innovative and a good way to get a motorist's attention. The farm stall itself was divided into different sections with lots of hand made good on display. Because the area is famous for its cherries, cherries (the fruit and not the dress wearing kind *wink*) makes up the bulk of the items on sale. The had everything from cherries in syrup to cherries in liqueur, cherry ice cream topping and cherry jam. Unfortunately they wouldn't let me take a picture inside the shop which is something I often can't understand. Its free promotion. Now if I was brandishing a Getaway or Weg travel magazine business card it probably wouldn't have been a problem, but because I'm a blog I get blown off. Pfft... Whatever... Vent over. 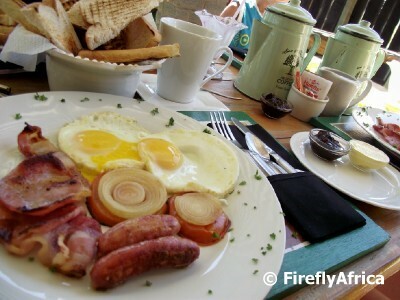 On our return trip we stopped at Constantia again for breakfast and wasn't sorry we did. Bacon, cheese sausage, eggs, coffee in enamel coffee cans, boere beskuit (farm style rusks) and cherry jam with my toast. Just the refill every driver needs on the long road. Its always exciting coming face to face with family. Even if that family is a species or two removed. Not that I'm saying I have family that are baboons. Some friends could be another story... On one of the days we spent swimming at the Cascades falls in the Drakensberg we had a troop of baboons pass us as they made they way along the Mahai River. The one female had a tiny little baby with here and she parked herself not very far from me showing off the little one for the camera. 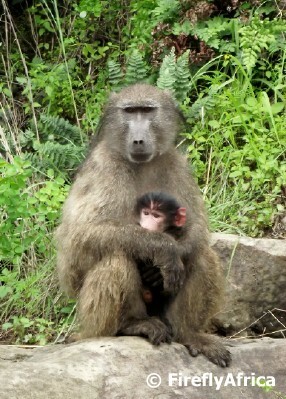 The Chacma Baboon, also known as the Cape Baboon, is one of the largest and heaviest baboon species and can weigh between 15 and 30 kilograms. The males are considerably larger than the females and have canine teeth as long as 2 inches, which is larger than the canines of a lion. 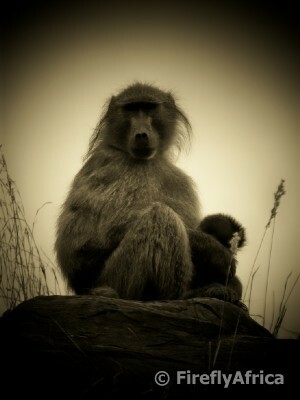 The Chacma baboons in South Africa are usually dark brown and is quite wide spread throughout the country. 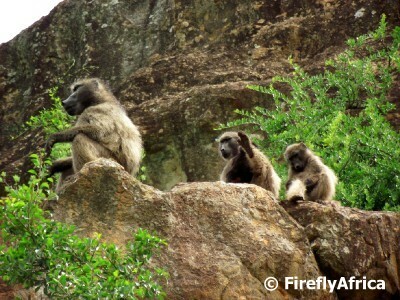 Chacma Baboons live in social groups which is normally led by a dominant male. 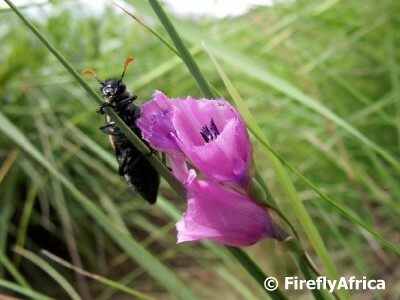 They are omnivorous with a preference for fruits, while also eating insects, seeds, grass and smaller vertebrate animals. 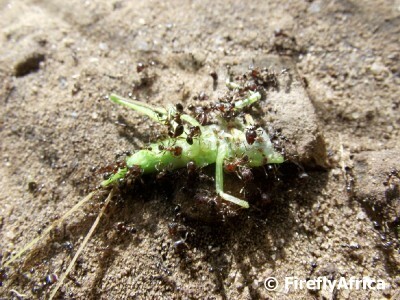 Unfortunately they can become pests around campsites as they quickly learn that there are food to be scavenged from bins and will then keep on coming back to an area and could easily become pests. 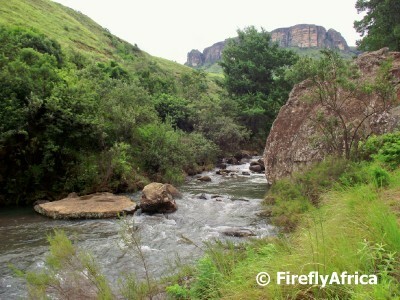 I have mentioned in other posts that we had a lot of rain during our stay in the Drakensberg. Our first day was a nice sunny one on which we did the Lookout Rock / Tiger Falls trail. 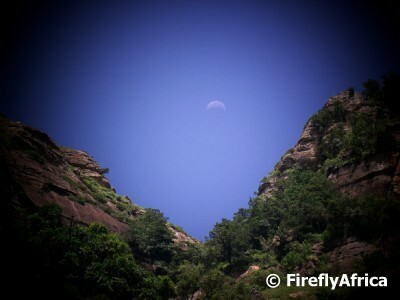 At the top of the trail I took a photo of the moon just above the mountain. I didn't notice that the moon was "pouring out". The old people used to say if the moon is "pouring out" (upside down) then its going to rain. 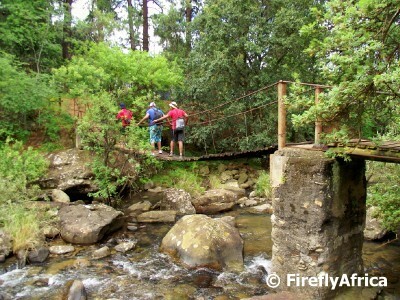 The first short hike we did on our stay in the Royal Natal National Park in the Drakensberg was a 6km round trip starting at the gate of the Mahai campsite. The route took in sights like Tiger Falls, Lookout Rock and the Cascades and takes one up a very steep climb and gradually back down in an anticlockwise direction. Because we were going to do the walk with the Rugrats we decided to rather do it in a clockwise direction as they would have struggled up the steep section. Right from the start of the walk going up the rolling hills the fantastic views started to open up all around. It was a nice sunny day and the mountains were stunning. From the top of the first hill we looked down on the Mahai campsite and we could see our tent in the distance. For the first kilometer Drama Princess was at her best objecting to the hike and trying to find every reason in the book for us to turn around while Chaos Boy loved the walking and took the lead. About two kilometers into the walk we entered the protea belt that seems to run along the mountains as we encountered it on another walk at about the same distance up the mountain. 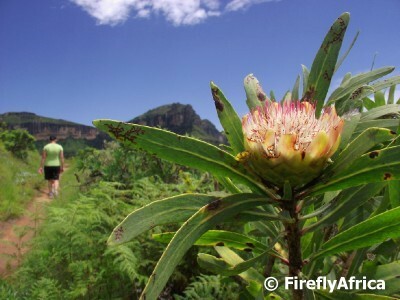 The Sugar Bush is one of 6 protea species that grow in the Natal Drakensberg and must be breathtaking when its all in flower. At this time of the year only a few of the bushes had flowers on them though. By now Drama Princess had gotten into the walk and stopped moaning which meant that we could enjoy the scenery more without having a running (walking) battle with her. Just after the halfway mark we passed the Tiger Falls. 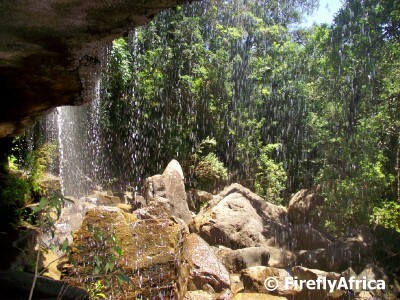 By now the day was starting to get hotter and we paused for a rest at the bottom of the waterfall. The Rugrats had their costumes on and it wasn't long before they cooled down in the cold mountain water tumbling over the falls. 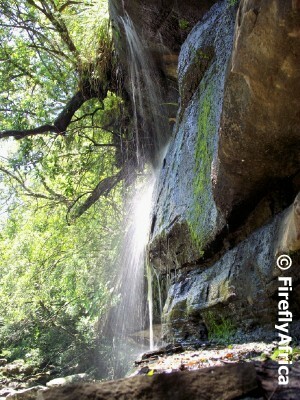 I will do another post at a later stage with a couple more photos of Tiger Falls. The literal highlight of the tour was getting to Lookout Rock. Here we encountered a number of huffing and puffing red faced folk who have come up the steep trail and who you could have knocked over with a feather when they realised that they could have done the trail in reverse and avoided the hill. 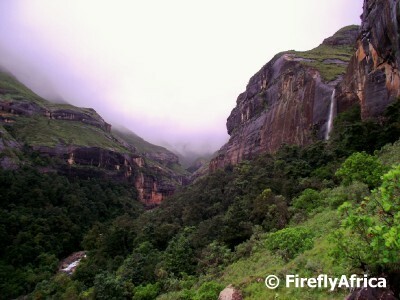 Looking up towards the mountains you could see Gudu Falls in the distance. If I had an extra day at the end I would have attempted the walk up there, but there was just too much to see and with all the rain we had not enough time to do it in. Down the valley we could see our final destination back at Mahai in the distance way below us. On the way back down we had a swim at Cascades, but that's for another post. Oh yes, and while going down the hill I was looking around so much for things to photograph that I missed the path and rolled my ankle. It didn't stop me though and for the next two days I made my way around, somewhat slower, with a tennis ball sized ankle. Yes, it moved. 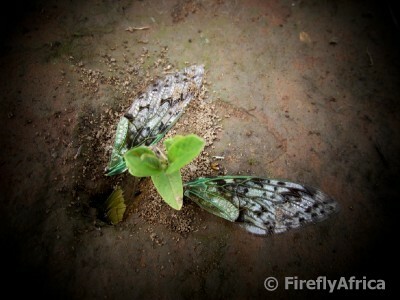 It was walking along like a worm by moving (pulling in) its back and then pushing away with its front. If that makes sense. Very unusual indeed. I haven't been able to find it on the internet yet, so if anybody has info I will update the post with it. 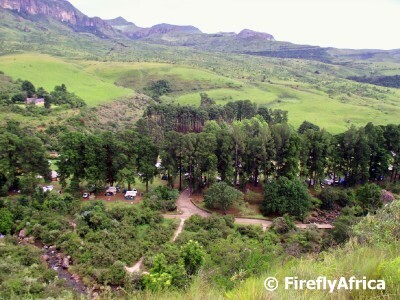 We spent 10 days of our two week summer holiday in the Drakensberg camping in the stunningly beautiful Royal Natal National Park. The 8000 hectare park was established in 1916 and received its name after the Royal family visited it in 1947. Unlike the name suggests the park isn't a National Park run by SANParks, but a provincial park managed by the KwaZulu Natal Parks Board. 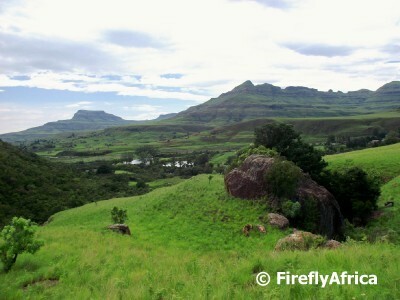 The majority of the Drakensberg mountains photos that I have posted and will be posting was taken inside the park. 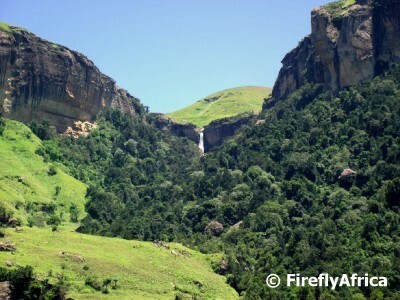 The main feature and attraction of the Royal Natal is the awe inspiring Amphitheatre. The 5 kilometer wide 1220 meter high rock wall towers above the rest of the park and on a clear day is a stunning site from both inside the park as well as from the surrounding areas. Mont-aux-Sources (3282 meters above sea level) is the highest point on top of the Amphitheatre and was named such as the area is the source of both the Orange River running west and the Thukela (Tugela) River running east. The main activity in the park is hiking with a number of excellent short and medium trails criss crossing the park taking in the mountains, rolling hills, streams and waterfalls. 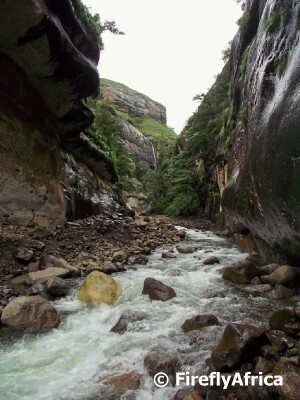 The most popular walk is the trail up the Tugela Gorge. 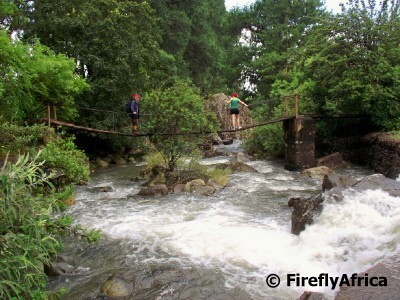 The trail leads you up the river and into the gorge right up to the Amphitheatre where the Tugela Falls, the second highest waterfall in the world cascading down five free-leaping falls for a total of 948 meters. 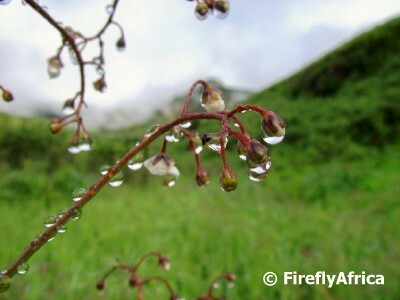 During our stay we camped at the stunning Mahai Campsite with its beautiful mountain views. The best part of staying at Mahai is that you don't have to get into your car to reach the start of most of the hiking trails as they start right outside the campsite's gate. All the trails and sites of the area as well as a separate post on Mahai will still be covered in future posts. Drama Princess lost one of her front teeth yesterday morning and put it out in a slipper last night along with a piece of cheese for the Tooth Mouse. Now that's where a father with a photo blog and curious followers come in. I set up the camera with a motion censor *wink* and when I got to it this morning *wink wink* there was a picture of the tooth mouse caught at the moment just after dropping off the money and ready to have a bite of cheese. HA! I hope this will serve as proof for all those folk who think its parents that take the teeth in the depth of night. The Tooth Mouse revealed! UPDATE: There seems to be a bit of confusion that I probably need to clarify. 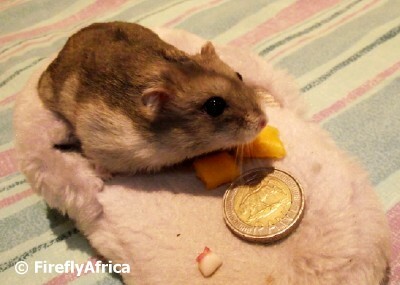 Although English speaking people normally refer to the Tooth Fairy, Afrikaans folk refer to a Tooth Mouse. On this occasion I snapped the Tooth Mouse, but who knows, with the next tooth it may be the Tooth Fairy coming for a visit. 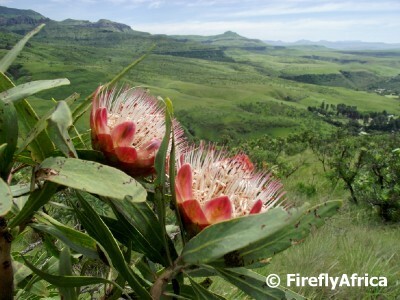 Whenever we went for a walk on one of the trails around the campsite and started climbing up the mountain side across the rolling hillsides, we would pass through a protea belt. I was always under the impression that proteas, being a plant in the Fynbos (Cape Floral Kingdom) biome, only occurred in the Western and Eastern Cape, but quite clearly there is a protea specie that thrives at high altitude in the Drakensberg. I'm not too sure what the specific specie is as most of the flowers have dried already, but I can imagine that the mountain would be even more beautiful when they are in full bloom. UPDATE: As said in the comments below, this protea is a Sugerbush. 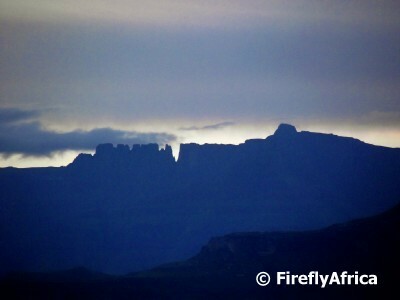 We spent our two week annual summer holiday in the magnificent Northern Drakensberg and although we had buckets... no truckloads of rain during our stay, it was a stunning holiday in an awe inspiring environment. By the time I get to post all the pictures I have taken (well, those worth posting at least), I would probably have run out of adjectives to use to describe how awesome the place is. 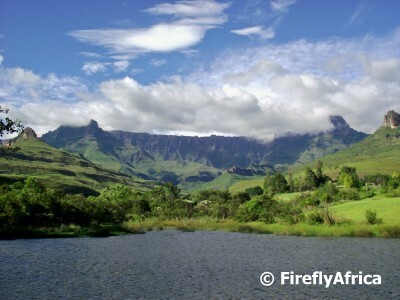 The Drakensberg is South Africa's biggest mountain range and is mostly situated in the province of KwaZulu Natal bordering the provinces of the Eastern Cape and Free State as well as Lesotho. The mountain is divided into three main areas. The Southern Berg, the Central Berg and the Northern Berg, which is the area we visited. 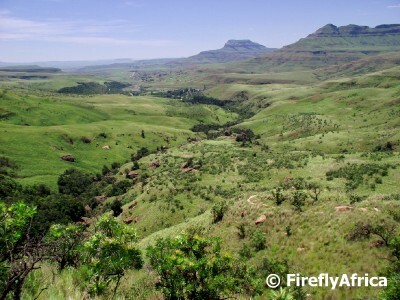 The uKhahlamba Drakensberg Park which covers these areas has been declared a UNESCO World Heritage Site which spans 150km over 243 000 hectares at an average altitude of 3000 meters. 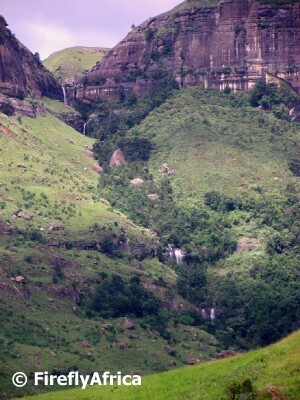 The uKhahlamba Drakensberg Park was selected as an UNESCO site for two reasons. 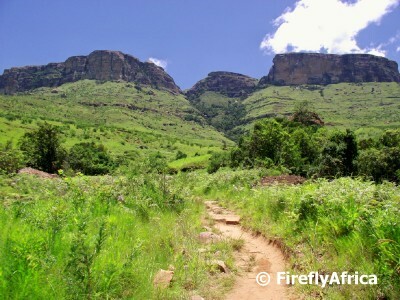 Firstly for the fact that the Drakensberg has the biggest concentration of rock paintings in Africa south of the Sahara which was left behind by the San people and shows off their way of life and believes. The second reason is the exceptional beauty of the area with its soaring buttresses, dramatic cutbacks, high altitude rolling grasslands, rocky gorges and steep river valleys. 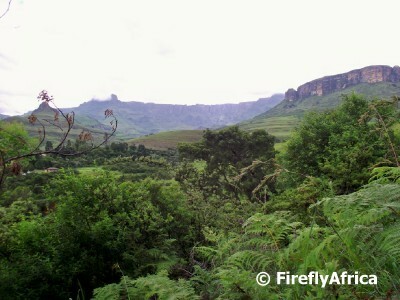 The Berg is also home to many threatened endemic species of birds and plants. I have to be honest and say that I would have selected the park a World Heritage Site for exactly the same reasons if it was my call to make. The area's beauty is breathtaking, the mountains are magnificent and there is nothing like the sound of a river or stream running through the mountains. Most areas in the park can be accessed by hiking trails, some short half day trails while others are longer overnight ones. 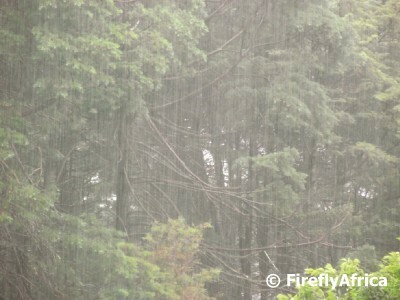 As I said at the start of the post, we had a fair amount of rain to say the least. 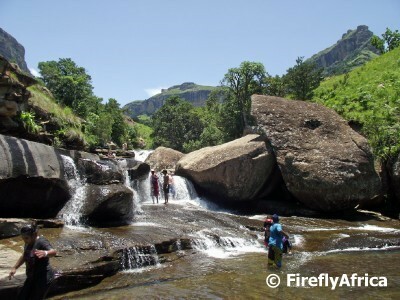 This didn't just mean that all the rivers were just about coming down in flood, but also that the waterfalls of the Drakensberg showed off its full glory. At the end of our stay we could actually see waterfalls on the mountainside which wasn't there when we got there. All in all our stay was a memorable one. Have I mentioned that the area is awesome? 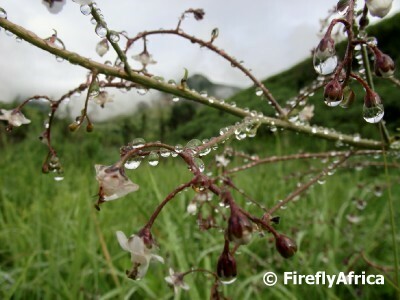 I found these rain drop beads clinging to this particular plant on a morning walk up the Tugela Gorge after lots of rain the previous night. It was quite amazing how it clung to the plant in perfect beads even though it had fallen off most of the other plants by now.